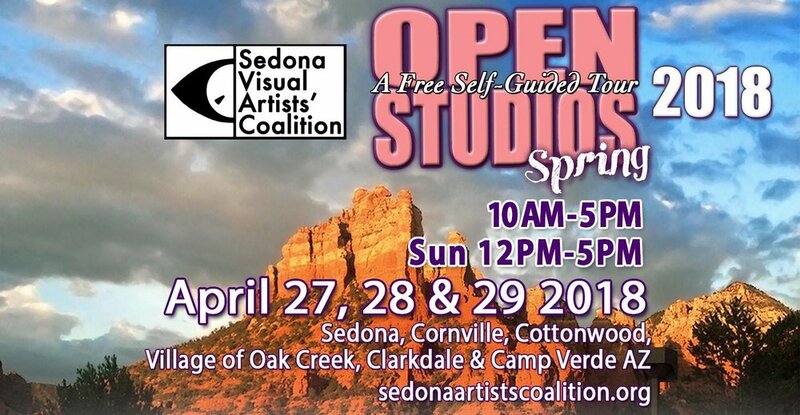 SVAC’s BI ANNUAL OPEN STUDIOS ART TOUR is a celebration of the arts and artists in the greater Verde Valley. This non-profit, artist-run event provides thousands of visitors a unique opportunity to meet the artists and gain a first-hand view of their creative processes. The event is funded entirely by artist participation fees and community support. The weekend event is a free, self-guided tour allowing visitors the opportunity to meet and talk with artists in their daily work spaces. There will be over 40 studios participating, working in a variety of mediums, such as: ceramics, painting, fiber, photography, jewelry, watercolors, and sculpture. Michael Bolen is best known for his functional pottery with themes reminiscent of aboriginal designs, be it carved into the piece or simply applied to the surface. Each piece is mindfully created and fired using a wide range of techniques. The resulting pieces are quite unique visually and tactilely pleasing. Over the course of forty years as a ceramic artist, Michael Bolen has drawn inspiration from such artists as Paul Souldner, Warren Mackenzie, Vic Bracke and Luna Patterson. Each presenting a unique approach to ceramic art. Michael is a member of the Reitz Ranch Center for Ceramic Arts in Clarkdale, AZ. Dexter Woods is a first generation ceramicist from Dallas, Dexter’s teaching experience took a professional turn when he moved to Phoenix in 2015 and worked as an instructor at a private studio. In Dexter’s words; “Art is my outlet, to try to understand the world and myself. I love exploring form through clay and reaching for the limits of it’s memory. The first time I touched clay, it did exactly what I wanted it to do and I realized the limitlessness of the medium. Dexter is teaching and working with atmospheric firing at the Reitz Ranch wood and salt/soda kilns, as well as helping in developing various programs at the ranch, and making sculptural and functional ceramics. Ian Hall is a Northern Arizona local from Flagstaff, AZ. Ian is the Ranch's first resident artist. Ian focuses on abstracting the function of his ware in order to deliver his perspective on functional and sculptural pottery in attempts to give the viewer a unique piece of artwork. He plans to take the lessons and knowledge learned at the Ranch to a university after completing his residency. Ben Roti is a ceramic artist who studied at the University of Iowa. After finishing his BFA, Ben accepted a position as a studio assistant to ceramic artist, Don Reitz in Clarkdale, Arizona. Over several years (2010-2014), Ben had the opportunity to work with Don Reitz in the studioand assist with workshops across the country. At the Reitz Ranch, Ben furthered his knowledge in atmospheric firing with wood and salt types. Since Don's passing, Ben has returned to creating functional works using low-fire earthenware clay and has begun to develop a new body of work. Using reductive techniques, through sandblasting, Ben is able to build variations and create layers, which are inspired by the results that are commonly seen in atmospheric firing. Ben currently resides in Cottonwood, Arizona, with his wife, Kami and son, Leo.